Celina Kalluk was born and raised in Resolute Bay, Nunavut, to Zipporah Kalluk and Leonard Thibodeau. Celina has two brothers and five sisters, one sister-niece, and many more beautiful nieces and nephews. She also has four daughters of her own, Jazlin, Aulaja, Saima, and Ramata. She dedicates this book to all the mothers and fathers of this earth and to our wonderful children. Celina is also a visual artist and has illustrated several book covers and other literacy materials. Currently, she is the Inuktitut Language Specialist and Cultural Arts teacher for grades seven through twelve at Qarmartalik School in Resolute Bay. 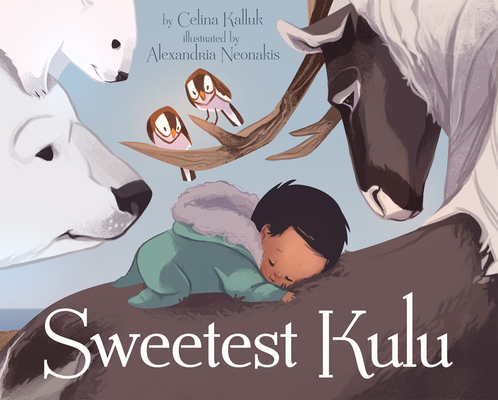 Sweetest Kulu is her first book for children.Alexandria Neonakis is an illustrator and designer from Dartmouth, Nova Scotia. She currently lives with her cat, “Kitty,” in Santa Monica, California.